Last week while on a mission to find replacement solar path lights (found them) and ideas for a retaining wall for a fire pit (…yes, fire pit perhaps to be added to the 2009 project list, perhaps going on the 2010 list), Dave came across granite pavers that looked like a great match for our walking labyrinth. 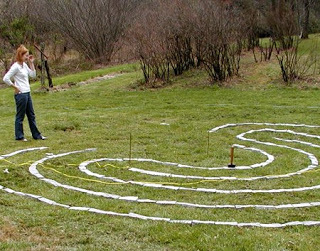 After going back and forth on what materials to use for the labyrinth, we settled on a simple 2-foot-wide grass path (for now). 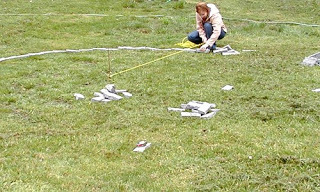 Our delivery of 888 granite pavers arrived in good time, much to Brigette’s glee, and we set about constructing the labyrinth using Dave’s excellent math and geometry skills and Brigette’s enthusiasm. We chose to modify the original 11-circuit classical style Visby labyrinth in Sweden that we liked into a 7-circuit labyrinth near our blueberry bushes on the south lawn, using the granite pavers as path dividers. 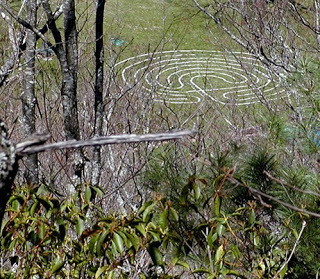 Our next step is to look at landscaping options for the outer perimeter of the labyrinth. Some of our initial thoughts for a privacy hedge are Nandina Domestica, also known as heavenly bamboo (although it can be invasive in our area if not kept under control), viburnum (so many choices of viburnum to choose from, but we’re looking at a semi-evergreen group), forsythia and the mountain laurel and azaleas that are native to our area. This entry was posted in Uncategorized and tagged improvements, outdoors by Inn on Mill Creek. Bookmark the permalink.